Meloche’s modern, energy efficient Double Hung windows make it an easy choice for replacing any existing window in your home. They have dual venting capability and low maintenance. Whether they are installed in a bathroom, bedroom or even at the front of your home, you’ll appreciate the quality and performance year after year. Full exterior fibreglass spring-loaded screen that makes for easy removal. 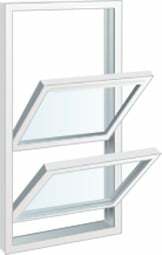 Both upper and lower sash are operable for ventilation purposes. Both sashes tilt in for easy cleaning. Balances provides structural integrity to the sash for improved sash openings. Night latch feature to allow for added security while still providing air flow.